A few weeks ago I met some friends at Tiffen down on Devon Avenue for their lunch buffet. (I was going to post a link but they have loud annoying music on their site so I won't.) I had heard both good and not-so-good things about it on Yelp, but the positive reviews seemed to reflect my tastes and the criteria by which I judge a restaurant, so I was looking forward to trying it out. I intentionally left a little early, hoping I would have the chance to duck into one of the Indian grocery stores on Devon to grab some red lentils and yellow split peas. I made it with plenty of time to spare so I wandered down the street and popped into the first grocer's I found. I spent a little time in there because they had about fifty different kinds of lentils and beans, and I wanted to make sure I had seen all of the varieties available. I had no trouble picking out some red lentils (masoor dal) since they are basically all the same, but I had read that some yellow split peas were coated with wax to make them look more presentable, and I wanted to see if I could find any that were not coated. While I was looking for the yellow split peas I saw a bag of split desi chickpeas (channa dal), and decided to grab those instead. The desi chickpea is related to the chickpeas we commonly use here, but it is smaller and has a sweeter, nutty taste. I have never seen them in the grocery stores in my neighborhood, so I was excited to find them on Devon Avenue. I was curious to see how they differed from the chickpeas with which I was more familiar. After I had cooked the chickpeas, I tasted one. It is indeed sweet and nutty, and not nearly as mealy as the European variety with which I am more familiar. These would be delicious all by themselves. I really liked the Spicy Indian Yellow Lentil Curry recipe I used for the yellow split peas I had bought before, so I decided to use it for the channa dal. I didn't have any tamarind paste, though, and I didn't think about that in time to remember to pick some up when I was on Devon Street. I did still have amchur in my spice cabinet, though, so I used about a tablespoon of that and added the same amount of brown sugar, hoping it would give a similar effect. I'm happy to say that it did. I had some fresh dill on hand, so I decided to make dill rice to go with the curry. They complemented each other perfectly. And how was Tiffen? Those reviewers who question the authenticity of the cuisine might be correct, but I am no expert. The food was good, the atmosphere was pleasant, there was nice variety of dishes, the tandoori chicken was especially tasty, and the service was pleasant. It was a little more expensive than some of the other restaurants in the neighborhood, but at $10.99 I thought it was well worth the price. I would definitely go again. Also well worth the price. 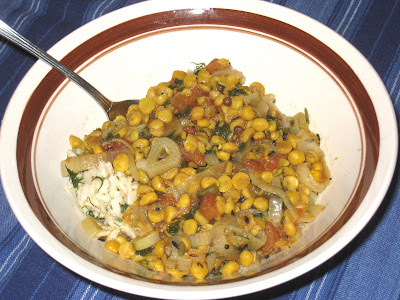 "This is Gayatri Venkatesh's recipe from the Thursday magazine. Its really tasty. You can tone down the spiciness by reducing the number of green chillies if you please. Enjoy!" Heat 1 tablespoon of oil in a pot. Add mustard and cumin seeds. Cook until seeds begin to pop. Once they stop spluttering, add coriander seeds, asafoetida powder, bay leaves and green chillies. Stir-fry for 5 minutes. Add shallots and stir-fry till they become golden brown in color. Remove from heat and add to the lentils. Stir well. Add tamarind pulp and salt to taste. Mix well and bring to a boil. Sounds really yum and hearty !